“It is by upholding the centralized, unified leadership of the Party that we have been able to achieve the historic transformation, usher in a new era of reform and opening-up, and embark on a new journey of great rejuvenation of the Chinese nation,” he said. All Party members and people must maintain a high degree of awareness in terms of thinking, political orientation and actions in ensuring leadership by the Party — a fundamental principle that bears on the future of the Party and the country, Xi said. In his speech, the president pledged to uphold a people-centered philosophy and to seek happiness for the people while striving for national rejuvenation. “The aspirations of the people to live a better life must always be the focus of our efforts on the path of moving ahead,” Xi said. Xi stressed the guiding position of Marxism and pledged to continue theoretical innovation based on actions. It’s the CPC’s historical responsibility to develop Marxism in China today, Xi said. He stressed the need to stay on the path of socialism with Chinese characteristics and to uphold and develop socialism with Chinese characteristics. Over the past 40 years, the theme of the Party’s theories and practices has been to uphold and develop socialism with Chinese characteristics, Xi said. Xi reaffirmed the commitment to strengthening State-owned businesses while also encouraging, supporting and guiding the development of private business. Xi highlighted the importance of clean governance, saying that all corrupt officials must be cleared away to ensure a clean political ecology to push forward reform and opening-up. “We have firm political resolution and great capability to safeguard national sovereignty and territorial integrity, and not even a slice of the homeland’s sacred territory can be split,” Xi added. 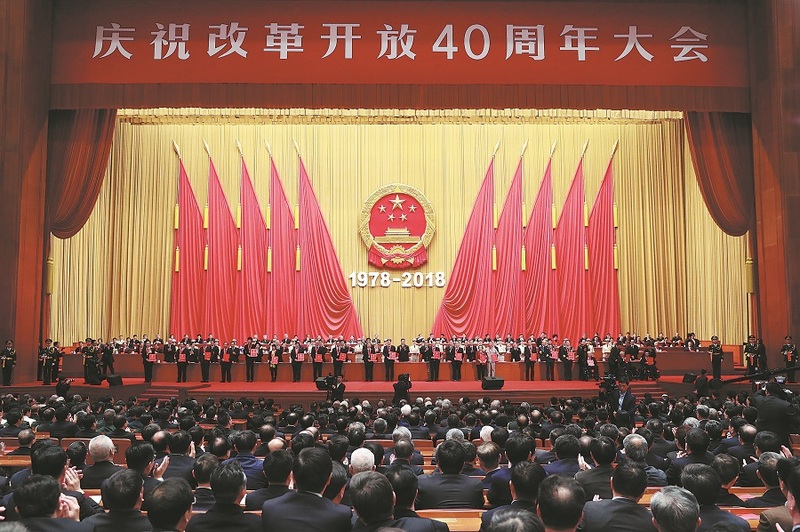 Also at the gathering, 100 Chinese were awarded the medals of reform pioneers and 10 foreigners were honored with China reform friendship medals.